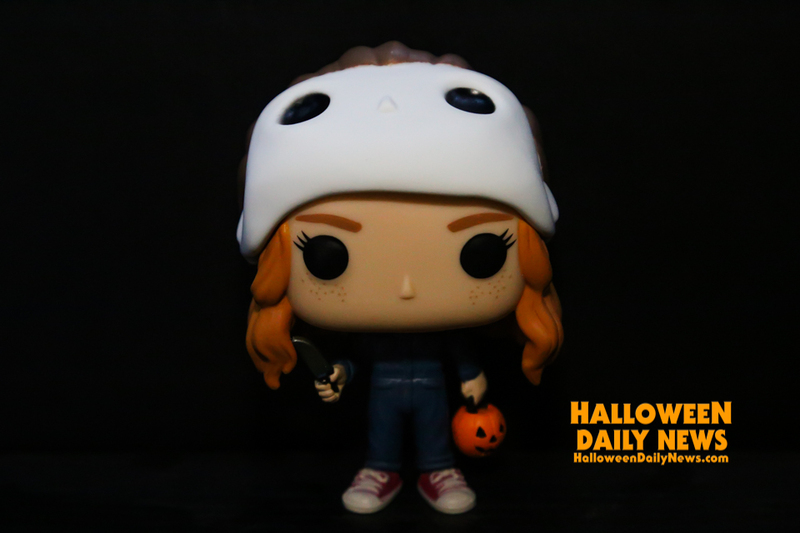 We love the Netflix series Stranger Things and one of our favorite aspects of the show is spotting all the nostalgic references to the iconic movies, characters, and brands of the early 1980s, and one of the best of those in Season 2 is when the new character Max (played by Sadie Sink) goes trick or treating in a Michael Myers costume, and we finally got our hands on Funko’s Pop vinyl variant figure that pays tribute to this awesome scene from the episode Trick or Treat, Freak. While you can find all four of the guys from the show in their Ghostbusters Halloween costumes and a regular version of Max available everywhere, this version of Max in her Michael Myers costume is a variant figure available exclusively at Hot Topic. While the mask featured in the series is actually a Trick or Treat Studios mask that was of course not really available in 1984, it is believable that Max’s older brother would have dressed as Myers a few years prior, likely around the release of Halloween II, and that Max would then claim the costume as hers. The figure features Max in the blue Myers coveralls, the mask pulled up and resting on her head, with a knife in one hand and a jack-o-lantern pumpkin pail in the other, just as she’s seen in the episode. Stranger Things 2 is now available on Netflix. Watch our video of the new Max in Michael Myers costume Funko Pop figure below, and then scroll down to see more of the figure in our photo gallery! Download Free ‘Halloween’ PC Game Now!